Foye sat on a chair not so far from the center of the assembly that he would be thought aloof, though he’d been accused of that and worse since he’d begun his tour of countries that had the single advantage of being far from England. He was not by nature a gregarious man and was even less so now, or so he’d been told by people who had known him before. True enough. For the second time in his life, he was a changed man. What a pity he didn’t like the change. Sabine Goddard is a young woman of high standing raised by her Oxford Don uncle. When a lie destroys her reputation, she and her elderly uncle travel to Turkey to escape the gossip. In Constantinople, she meets Edward, Marquess of Foye, a man hurt by the lie that forced her to leave London. Foye fascinates Sabine. He’s outsized and refers to himself as a beast, but he doesn’t care that she’s better educated than many men. His belief in her innocence intrigues her and earns her admiration. Sabine captivates Foye and the far-from-handsome man can scarcely believe she returns his feelings. When Sabine and her uncle fall into the hands of a Turkish Pasha, Foye will do anything to secure the safety of the woman he loves. Indiscreet was originally published in North America by Berkley Books. All rights have reverted to me. This book is now available world-wide. Do you have the most recent version? 2014.10.04: New cover. A couple typos caught. Indiscreet is a beautifully written, almost epic type romance. The exotic setting adds to the luscious story between these two stoic and breathtaking characters. Edward, at first, comes across as cold and a bit egotistical. Sabine is shown as a woman who seems so lost because of a false indiscretion that has almost ruined her life. When these two enter each other's world, they are changed forever. Carolyn Jewel is one author of the historical romance genre that you can always count on to deliver a book with an amazing story and a romance that will blow you away. Indiscreet is such a book. Ms. Jewel has written a wonderfully emotional story. The characters are interesting and engaging. Their pasts have formed them as they are in this book. The story is packed with adventure and danger. Over every other emotion, the reader will experience the depth of the love between Edward and Sabine. This is one of the best books I've read all year. I would highly recommend it to others. There is just so much to admire about Indiscreet, from the restrained but lyrical prose to the depth of the protagonists' characterizations, to the lovely surprises placed throughout the novel that challenged and shifted my expectations subtly but effectively. 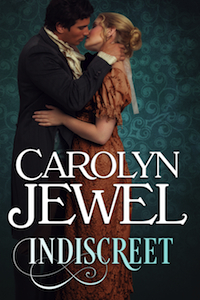 For the reader who wants fresh settings, for the reader who likes traditional Regencies, for the reader who likes character-driven stories, and for the reader who likes adventure and a larger scope in Romance, Indiscreet is a wonderfully satisfying read. I think that's just marvelous writing, the kind that makes me want to savor every word. There is such a smoothness to the language here and yet it doesn't call attention to itself because it directs all of our attention to the characters and what they are feeling. The result is some powerful emotion in the reader. This is a writer at the top of her craft, which is why, caveats aside, I highly recommend this book.